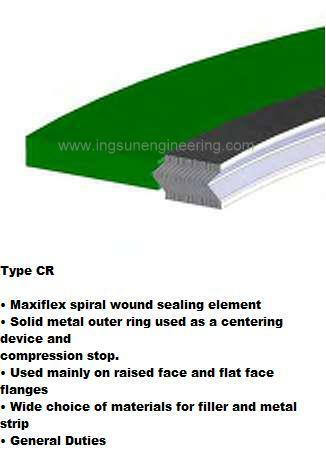 This is the “Maxiflex” spiral wound gasket basic sealing element. Several layers of specially formed continuous V-shaped metal strip are spirally wound with alternate plies of soft filler strip. The “V” profile allows the gasket to act as a spring and the depth is carefully controlled to bestow the sealing element with the best compression and recovery characteristics. In order to further enhance the mechanical and sealing properties of the gasket, it is normal practice to apply several layers of the metal strip only to the inner and outer diameters. Computer-controlled winders carefully monitor and adjust the tension of the winding strips. A uniform density throughout the product is produced. This provides the spring-like action within the gasket which enables it to maintain a seal even when subject to fluctuating compressive loads.